The Village of Northville Historian collects historical photos, documents, scrapbooks, genealogy and maps. 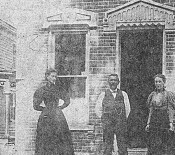 The Historian provides information on the Village of Northville’s History. The site of the village was first settled around 1786, but areas south of the village were settled around 1762. The village was once on high ground next to the Sacandaga River valley. When the Sacandaga Reservoir was flooded in 1930, that valley became an arm of the Great Sacandaga Lake. 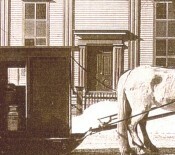 Northville was incorporated in 1873, setting itself off from the Town of Northampton. The Conklingville Dam, finished in 1929, brought about the expansion of the Great Sacandaga Lake to the edge of the village. The Northville Historic District was added to the National Register of Historic Places in 2014. In this Issue: Northville Knitting Mill, Eli Van Brocklin, Newton Street Follow Up, Sacandaga Spectator, Miscellaneous Pictures from the Past, Genealogy - Where did it come from and when?